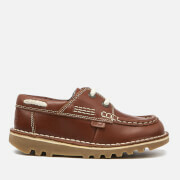 The kids’ ‘Reasan’ lace up shoes from Kickers are made from supple leather uppers, forming a smart yet practical design. Set upon a durable rubber sole, the school shoes feature a padded ankle and lace-up fastening with a moccasin-style toe. A cushion foam insole and mesh lining with Micro-Fresh® technology ensures all day support and comfort, with a lenticular fleurette and reflective strip to the heel in signature red and green colouring for improved low-light visibility. Finished with branded tabs to the sides.